This new Second Edition includes 188 Arkansas State URLs, of which 16 are catalog and reference links. The rest of the URLs link to databases. Three Hundred Thirty-Five National URLs are also included. There are an additional 10 pages in the Second Edition (as compared to the First Edition). 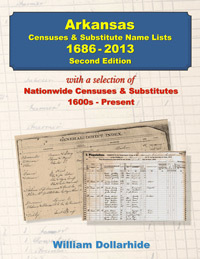 William Dollarhide is best known as the co-author and cartographer of Map Guide to the U.S. Federal Censuses, a book of 393 census- year maps, and one of the bestselling titles ever published in the field of genealogy. Mr. Dollarhide currently lives in Washington. He has written numerous guidebooks related to genealogical research.